When Nathan Sharpe retired as a player he was a giant of rugby union internationally. However he could so easily have bowed out as an AFL great. The 200cm Sharpe opened his sporting CV as an Aussie rules player at Wagga Wagga, in NSW. His height, toughness and natural ability would no doubt have shaped him as a standout in that game. 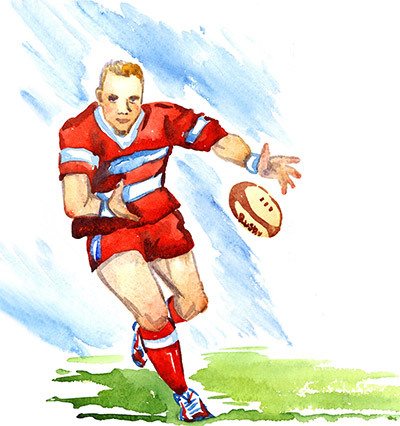 Fortunately for the ‘Game They Play in Heaven’ Sharpe’s family moved north and he was enrolled into the prestigious The Southport School and was introduced to rugby. Sharpe soon became a standout of the game and a pillar of the school. He represented TSS’s First 15 and First VIII rowing in 1994 and 1995. He was also school captain. His ascendency in rugby continued after he left TSS. National honours came in 1996 through the Australian under 19 team and then for three years, 1997-1999, he was a member of the Australian under 21s, captaining that team in his final year. Earmarked early as a future Wallaby, Sharpe joined the Queensland Reds squad in 1996. However and indication of the strength of that team, which included another towering lock named John Eales, was that Sharpe had to wait until 1998 before debuting for his State. His next major accolade was being selected for the Wallabies against France in 2002. That marked the beginning of a long and distinguished international career for the proud Gold Coaster. When he retired in 2012 he had amassed 116 Tests, etching him as his country’s most-capped forward and the second most-capped player. Sharpe was not only an outstanding player, he was also a leader. When the Perth-based Western Force joined the expanded Super 14 competition in 2006 they chose Sharpe as the man to captain the new franchise. He blossomed under the responsibility. In 2007 he was named the John Eales Medal winner as Australia’s premier player – an accolade he received again in 2012. Sharpe personified the mantle of ‘team player’. He even twice postponed his own retirement to answer an SOS from his national coach. In fact when he finally did hang up his boots, he did so as winning captain over Wales at Millennium Stadium. Sharpe remains one of this country’s most decorated players - a three-time World Cup combatant. But most significantly it is his own personal characteristics – including loyalty, humility, courage – which continue to stamp him as a sporting great well after that final siren.